Indian Railways on 14 July 2017 launched country’s first-ever solar-powered DEMU (diesel electrical multiple unit) train. This train was launched at the Safdarjung railway station in Delhi but it will run from Sarai Rohilla in Delhi to Farukh Nagar in Haryana. 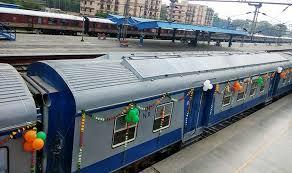 This train features a total of 16 solar panels being fitted in six coaches, each producing 300 Wp of power. The train has a power back-up and can run on battery for at least 72 hours. The cost of these solar panels, manufactured under ‘Make in India’ initiative, is Rs. 54 lakh. This is the first time in the world that solar panels are being used as grid in railways. With each of this type of train, Indian Railways is expecting to save 5.25 lakh litres of diesel in 25 years.